Imperio Garlic is an agricultural company established 50 years ago by Mr. Francisco Mira Hernández. From our origins as garlic producers and exporters we have been pioneers in the commercialization and introduction of selling formats which are currently present in most of the european supermarkets. We´ve also spread garlic to countries where there was no regular consumption.e. 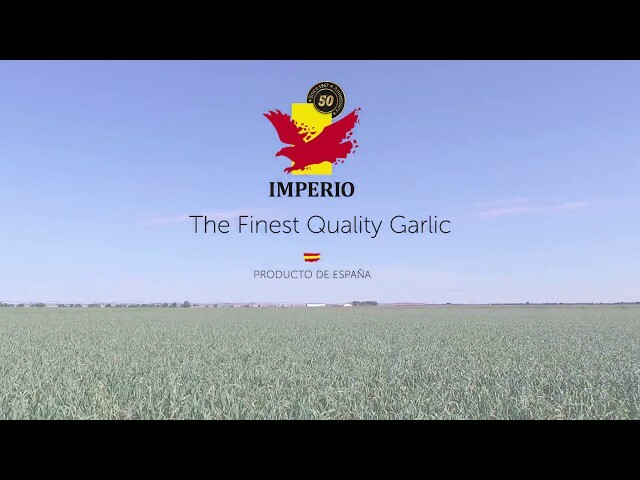 At Imperio Garlic we have evolved every year with the help from our clients: We´ve increased the garlic production, we´ve also improved the service and the quality of our products, by integrating technological innovations and commiting providing our employees with continous training. All this happens so that our consumers are fully satisfied. Our company is a garlic producer and we distribute at a national as well as international level. Our products, garlic and onions, are our pride, specially purple garlic, whose production has been acknowledged with the Las Pedroñeras PGI. Our products are sold in several packaging options to adapt to the most demanded needs of the consumers. The main value of Imperio Garlic is having our own crops. This strategy was established since the beginning and it makes our products unique. It’s also a guarantee that we can meet our customer´s demand, regardless of the volume and apart from the crop season. Purple garlic is an excellent quality product. It has special features that make it great. Today we would like to introduce you to Lara, a girl from Mallorca who gives the best of her behind the stove of Lara’s easy cooking, a cooking blog in which you will find recipes as tasty as easy to prepare. We’ve also included a link to the complete vídeo to prepare this recipe, so you can see how, in only a few steps, you can delight yourselves with this butter recipe that goes well with anything. Well, I’ve always enjoyed cooking, I remember helping my grandmother to prepare spongy cakes and stews and I loved the smell coming out of the oven. Blend the almonds, add the garlic and blend again. Mix and add the other ingredients, place all the ingredients into a food processor or blender. Blend on pulse until smooth.